(CNN) - Hundreds of people have been evacuated from flood-stricken areas of the Hawaiian island of Kauai after severe rain struck over the weekend, leaving swaths of land underwater. Rain and flooding Saturday night caused multiple mudslides, as well as power and water outages. One low-lying area was issued with an evacuation notice over fears a dam would burst, and the Kuhio Highway in the city of Hanalei was closed. The Kauai Emergency Management Agency (KEMA) said multiple landslides "continuously engulfed the roadway from 2 p.m. local time (8 p.m ET) Saturday." Hawaii Governor David Ige issued an emergency proclamation for the County of Kauai late Sunday due to the damage from "the severe, sudden and extraordinary event of heavy rains and flooding." "For context, the town of Wainiha, Kauai, recorded a staggering 822 mm of rainfall in just 48 hours," CNN meteorologist Pedram Javaheri said. "That amount of rainfall would climatologically take nearly 18 months to fall in London and over 24 months to fall in Los Angeles." Emergency rescue crews have evacuated 152 people by helicopter, 121 by bus and others by water, Ige's office said Monday. Gov. Ige and Kauai Mayor Bernard Carvalho flew with military and county emergency crews over heavily damaged regions in the Hanalei District, including Wainiha and Haena, seeing "the swollen Hanalei River, flooded neighborhoods and farmlands," according to the governor's office. "Damage is very extensive in this area. The immediate problem is access. Several landslides are blocking roads into the communities. "Crews are working to restore access to the Hanalei District, but it will take some time. We are establishing landing zones for aircraft. The Hawaii National Guard has deployed two UH-60 Black Hawk helicopters, two CH-47 Chinooks, eight Zodiacs and more than 45 soldiers and airmen to support rescue efforts, and to get medical aid and necessary supplies to the area," Ige said. The Red Cross told CNN Monday afternoon that 61 people were stranded at a Red Cross shelter inside a Kauai elementary school surrounded by flash flood waters. Coralie Matayoshi, CEO of the Hawaii Chapter of the American Red Cross, said 40 residents had been at the shelter since Saturday, with another 21 arriving Sunday night. "They came by boat, they came by jet-ski, they did whatever they could to get there," Matayoshi said. A representative for Hawaii's Second District Tulsi Gabbard posted a message on Facebook saying her heart was with those on Kauai experiencing severe flooding and mudslides. She thanked the US Coast Guard, Hawaii National Guard and first responders for the efforts getting support to those affected. In a statement posted on Facebook, the County of Kauai said emergency agencies were working to get water and supplies into Wainiha and Haena, from where more than 100 people had been airlifted. "Those who wish to be evacuated are advised that it is unknown at this time when they can return, as landslides continue to block access along Kuhio Highway between Waikoko and Wainiha," the statement said. It said that power had been restored to the Wainiha pump stations and that water services would be slowly restored to customers in the Wainiha and Haena areas. "However, DOW has issued a 'do not drink' advisory and a conservation notice for Wainiha and Haena customers. Those who are receiving water are also urged to heed the conservation notice," the county said. The U.S. Coast Guard said in a statement Monday that its helicopters had helped local authorities rescue hikers around Hanalei Bay Sunday after being asked to assist early that morning. 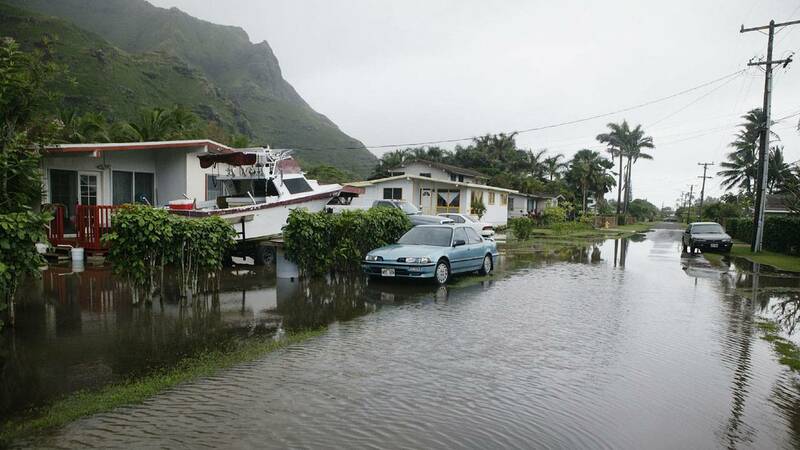 "The north shore of Kauai experienced flash flooding with waters rising between five and eight feet above average due to the severe thunderstorms and heavy rains, trapping many residents inside their homes and on rooftops," it said in a statement. "Crews from the Hawaii Fire Department and Ocean Safety and Lifeguard Services have been evacuating residents to higher ground via jet skis but were unable to effect rescues in the towns of Hanalei, Wainiha, and Haena," it said. In one instance, the coast guard said hikers waved down one of its helicopters above Hanakapiai Beach after being stranded for two days and were hoisted to safety. Honolulu coast guard command was also in contact with 30 hikers stranded on Kalalau Beach. "The hikers currently have food and supplies and are not in need of an immediate rescue," it said. Hawaii Department of Land and Natural Resources Division of State Parks said that in addition to the campers stranded in Kalalau, efforts were being made to contact and check on the safety of others who had camping permits. In a statement, the department said Napali Coast State Wilderness Park, Haena State Park, Polihale State Park and portions of Wailua River State Park remained closed following the storm. Damage to the roads leading into the Haena and Napali Coast parks meant they were likely to remain closed indefinitely, it said. Javaheri said the forecast for Kauai was set to improve over the next couple of days. "However, this is a part of the world is notorious for persistent rainfall over 300 days per year," Javaheri said. "I'd expect showers and blustery weather to continue in this region, although not nearly similar to the amounts seen in recent days." Kauai County said in its statement that the rain meant the Kalihiwai Reservoir had been nearing capacity Saturday afternoon and residents in low-lying areas had been told to evacuate. "Since that time, the dam has been inspected and it has been deemed safe for residents to return. Officials will continue to monitor the reservoir," the county said. It advised residents to stay out of flood waters. "Heavy rains have caused stormwater runoff throughout Kauai, leading to widespread flooding producing large areas of standing water. Coastal waters have also been affected and a brown water advisory remains in effect until further notice." Oahu and Hawaii also sustained flooding after heavy rains over the weekend. CNN affiliate KHNL said that the Honolulu Fire Department handled 42 weather-related emergencies -- including 32 water evacuations -- in Oahu on Friday night, mainly on the eastern tip of the island. Peter Kekahuna told KHNL that he had been out for dinner in Waimanalo on Oahu with his family when the storm struck Friday night. "It was pretty bad. I've lived here pretty much all my life, and it is one of the worst so far. Water was just flowing over the cars," Kekahuna said. He said the surge of water had sent cars and debris rushing towards homes and that some residents believed inadequate drainage was to blame. The community came together to clean up afterward. "Everybody was out here cleaning," he said. "I mean rubbish cans, we had dead chickens, you name it." A local farm told KHNL that the storm had left its crops 4 feet underwater. "The whole 12 acres that we have here, we're just going to have to reset and start basically from square one," KHML quoted operations manager Dillan Hanawahine as saying. "From the second the soil can dry, we can get in there and plow and finish cleaning up," Hanawahine said. "We're probably going to be a month out of just nothing." One Honolulu resident posted a picture on Instagram of her church's driveway flooded with 10 inches of rainwater. She said the church school and food pantry, which services 3,000 people, were also flooded.